The era of British coaches and coaching are brought back to life with a manuscript account book of one of the most renowned coaches and routes of them all, the London - Seven Oaks, for the years 1868 through 1872. It appears as if it had been run over by the mail coach - and an entire football team that later enjoyed cups of coffee and used the book as a coaster; there are more rings on its lower board than around Saturn. This book was used, and used well. I enjoy it when items such as this land on my desk. 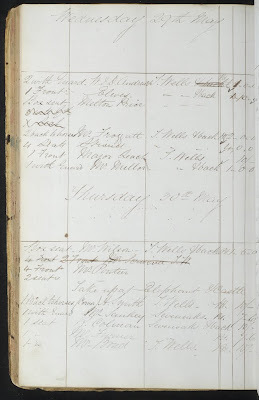 Manuscript account books, at first glance, appear to be fairly boring but nothing could be farther from the truth. While I generally can't account for my whereabouts and, too often, who I am, a good account book can tell you quite a bit about the particular business it accounts for, and the milieu in which the business operated. The fun, for a rare book cataloger, lies in the detective work. Here, it begins with the initials found at the bottom of the upper board. "C.A.R.H" was, it turns out, Charles A. R. Hoare, Esq., who, prior to assuming proprietorship of the London Seven Oaks coach, was Master of the Vale of White Horse hounds. Having identified who C.A.R.H. was the world opens up and a story emerges. "Towards the end of the season of 1867, Mr. Charles Hoare started a coach between Beckenham and Sevenoaks. 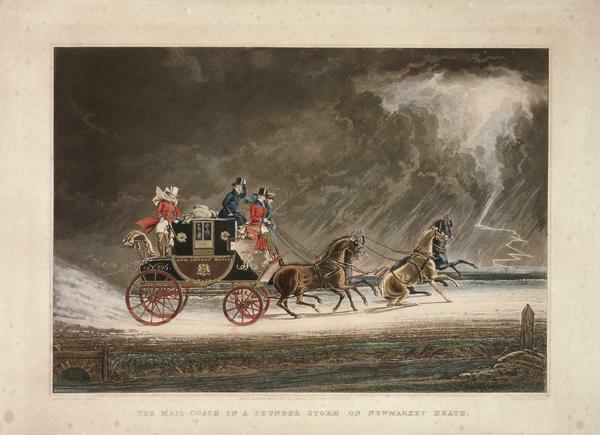 This developed the following year into the Seven Oaks coach, starting from Hatchett's [White Horse Cellar, in London], and this carried such good loads, that in 1868 its proprietor carried it on to Tunbridge Wells, to the delight of thousands who have since enjoyed the exquisite scenery it has introduced them to. Since 1868 the Brighton has continued a single coach, but several new candidates for public favour have appeared" (Old and New London: Volume Four 1878, p. 262). 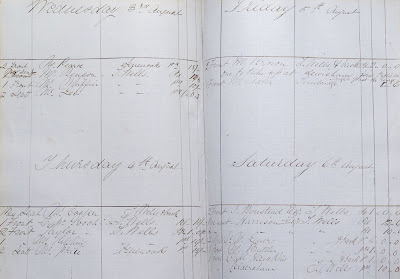 "Mr. Charles Hoare appeared for the second year in the role of coach proprietor; but this time ran from London to Seven Oaks instead of between Beckenham and Sevenoaks, with Comley as professional coachman, and Ike Simmons as guard. Mr. Hoare's coach was another link to the past. It was one of the mails built in the year 1831 by Wright, and when it was bought by Messrs. Holland & Holland (by whom it was let to Mr. Hoare on the usual mileage terms) it had V.R. and a crown on it, a proof that it had seen mail service during the reign of Her Majesty. "It had, of course, a single seat only behind the guard, whose blunderbuss case was opposite, and where the second seat would be. The hind boot opened at the top, beneath the guard's feet, so that he could easily drop his mail bags into the depths below. In order to give as much room as possible for the letter bags, the hind boot was deeper tha usual; and differing from the general plan, the boot was brought out flush with the body of the coach. In order to allow of the extra depth of the boot, the hind axle was bent downwards. "The 'old school' will perhaps smile at notice being drawn to these details; but they will pardon the digression on remembering that since coaches were driven off the road, a race has arisen to which the 'revival' is history, and the fashion of the Park drags a pattern, Such, at all events, was the Sevenoaks coach when it first came into the possession of Messrs. Holland & Holland; but, in order to adapt it to modern requirements, the guard's seat was lengthened to carry four, and a like number of passengers were accommodated where the guard's armory had erstwhile been" (Fitz Roy, Henry Charles, Duke of Beaufort. Driving. London: Longmans, Green, 1890, pp. 277-278). The accounts begin with the first season, “Friday May 1st/68” to “Monday 26th Octr.” ( leaves, followed by  blank leaves). 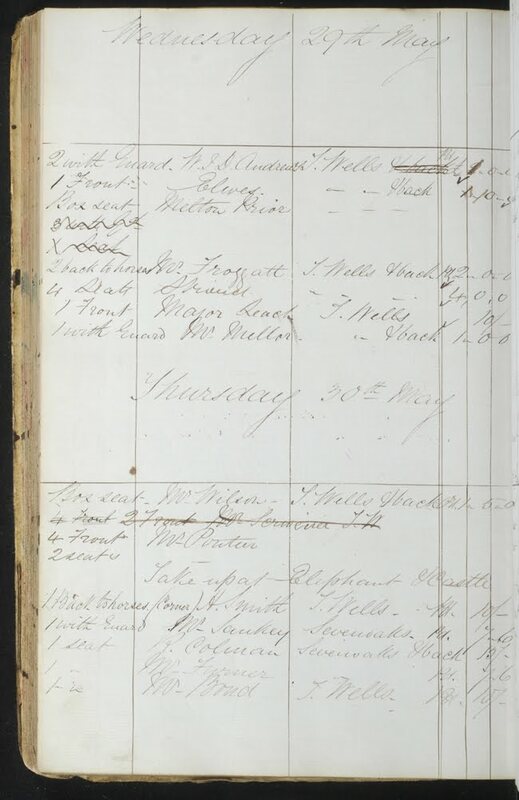 Each page is divided into columns listing the passengers’ names, the destination, the number and location of their seats, and the amount/fare paid. 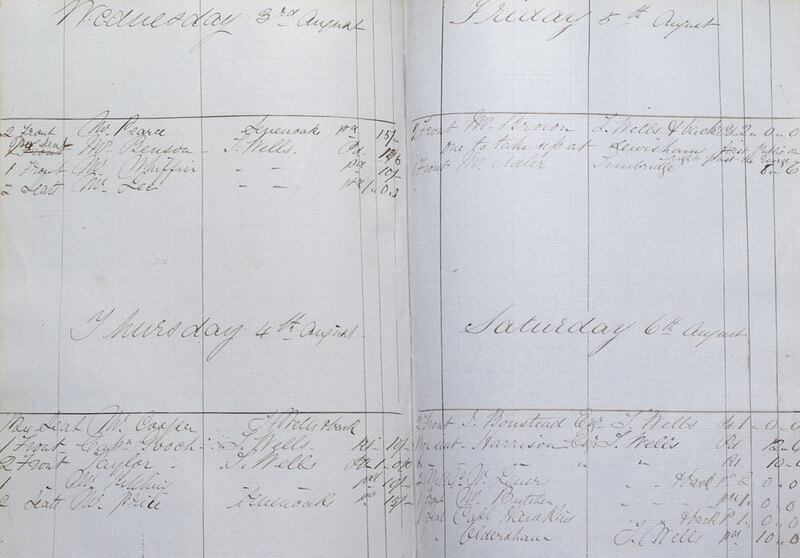 The accounts end August 21, 1872. It was in that year that Charles Hoare retired, leaving the Earl of Bective and Colonel Hathorn in command of the coach and route. In all, what has been left to us is a unique relic of a bygone era in British mail and personal transportation, and the day-to-day details, found nowhere else, of one of its most famous coaches. It is because of the unique details found in vintage manuscript account books that make them so attractive as a collectible. It's as if you're a silent partner in the business. [COACHES]. 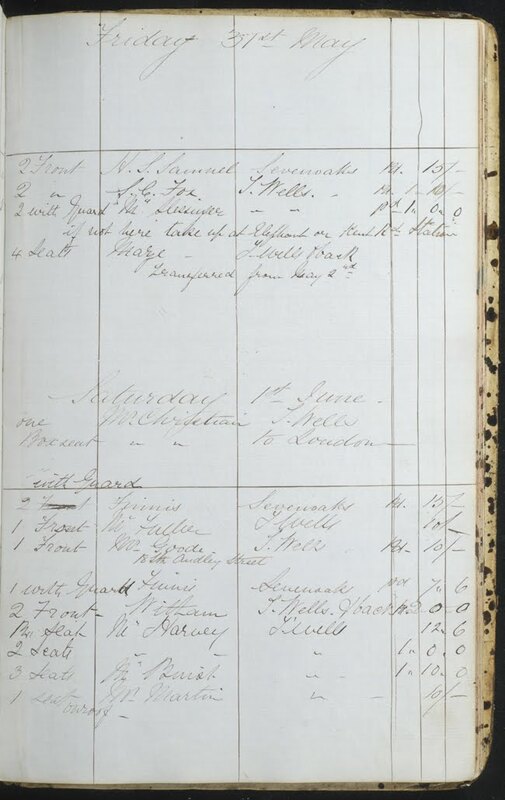 [MANUSCRIPT ACCOUNT BOOK]. Tunbridge, London and Sevenoaks Coach. Begun and Ended! [N.p. (London)]: -1872. Folio (12 7/16 x 7 7/8 inches; 317 x 201 mm.). Written in ink on blue paper (watermarked “W. Stradling 1863") ruled in ink. leaves. Quarter parchment over vellum boards. 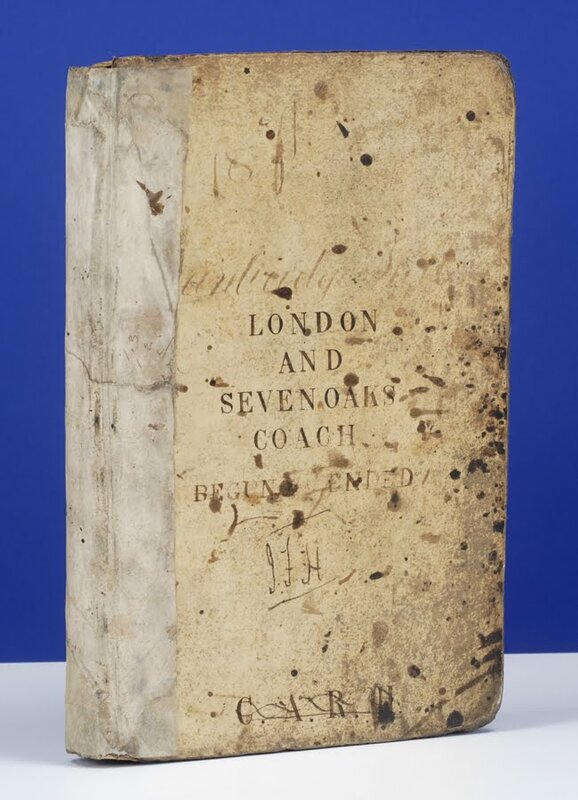 Front cover lettered in ink: London and Sevenoaks Coach/Begun Ended. Marbled edges and endpapers. Ink initials at foot of front cover: C.A.R.H. Additional ink initials on front cover: J.J.H. Amazing! I love getting glimpses into daily life in history.